My evening ended with a Peanut Butter and Jelly Lollipop and a rose. Not entirely what I was expecting from Q Haute Cuisine, but then again expectations are highly over rated. This restaurant came highly recommended by a friend who has been trying to bring me there for lunch for months now. When I found out the next Nugan Estates dinner was to be held at Q Haute I jumped at the chance to book for hubby and I. Imagine my surprise when I opened the front door and my friend was standing there waiting for her hubby. Such a happy coincidence! We got the chance to chat a bit at the coat check but ended up on opposite sides of the room for the time being. I was able to sit nearest to Matt Nugan and also across the table from Linda Garson, creator of Vine and Dine and Editor in chief of Culinaire magazine. Together she and I were charged with keeping Matt awake through our scintillating conversation as he had just arrived from overseas hours before the event. He was pretty tired but managed to work his way around the room and give lively and interesting backgrounds for each wine we were to enjoy that night. 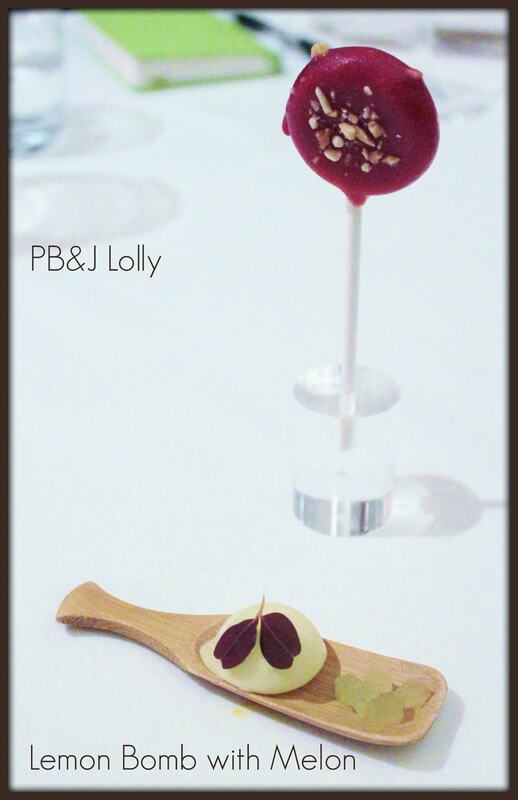 After being seated, Chef Michele Aurigemma treated us to some visually and orally appealing mini amuse-bouches. We enjoyed them in the order intended, beginning with the Hummus Spoon. On a tiny spoon sat a ball of hummus covered in a cocoa butter shell. It was all I was expecting then suddenly there was a large hit of herbs and citrus to complete the taste profile. I knew at once we were in for a treat that evening. Next, we had a palate cleanser disguised as a fluffy house made marshmallow covered in citrus zest. I’m a sucker for marshmallows, what can I say? Following the marshmallow was the favourite among all those seated at our table, a mini waffle ice cream cone filled with goat cheese cream and topped with chives. The cone’s sweetness balanced perfectly with the sourness of the goat cheese and in addition, the textures were also complimentary. Last but not least were the tiniest macarons I have ever seen. Chinese smoked tea flavoured macarons filled with a butternut squash cream. While they were extremely visually appealing, they were not as lovely as the mini cones. If the chef’s intent was to amuse our mouths, he did a lot more than that…I couldn’t wait for more! I thought that the King Valley Vision Sauvignon Blanc wine pairing was appropriate, especially with the mini cones and hummus. 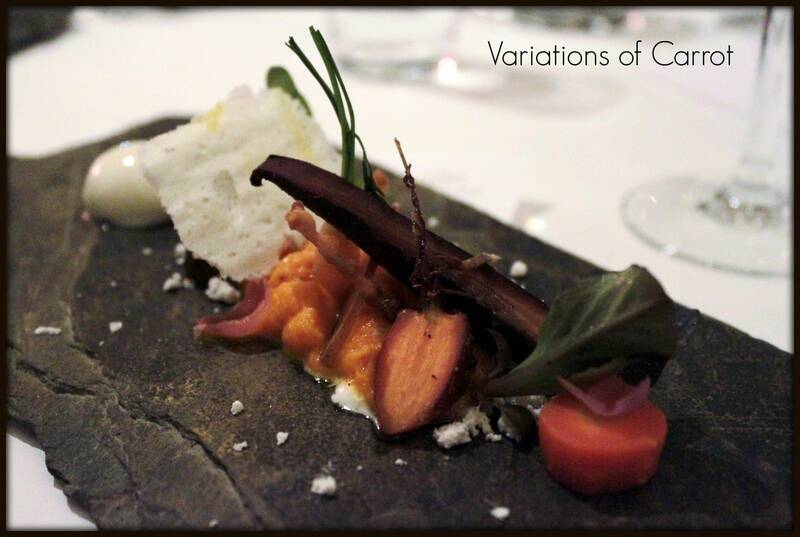 The next course was suitably named ‘Variations of Carrot’. We enjoyed the humble root vegetable in so many ways, pickled, puréed, smoked, deep fried, and poached in port. Supporting the carrot were walnut powder, dehydrated milk crumb, balsamic and Parmesan spheres, and chive pudding. This course was a touch diminutive in flavour so maybe was a bit over shadowed even by the pairing of the King Valley Chardonnay. I did enjoy the Chardonnay with the Parmesan and balsamic flavours. Our first protein course was next to make an appearance. Along with the Nugan ‘Alfredo’ Second Pass Shiraz wine pairing, Hubby declared this to be his favourite course. The tender, melt in your mouth Beef Cheek was amazing by itself, but paired with the caramelized goat cheese ravioli, Parmesan crisp, salsify, and roasted parsnip it was even more delicious. It was pleasing to remove the compressed pear and ‘unveil’ the beef cheek hidden below. The Second Pass Shiraz was my favourite wine of the night. To my surprise we were to have a second protein course consisting of lamb top sirloin. I’m really not that big a fan of lamb but then again, I’ve never had lamb done this way before. Normally the lamb sirloin is a flat cut of meat but when exposed to enzymes, it becomes a neat ‘mini roast’. It was also very tender and delicious. Chef Michele made sure we had a good dose of vegetables as well, adding broccoli rapini, purple potato, leek, and beet purée to the plate. 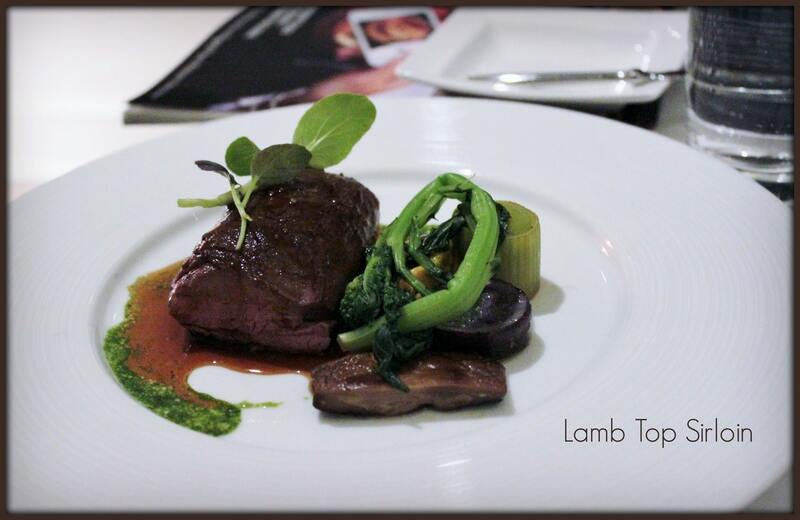 The lamb was served with a Madeira reduction. This second protein course was served with not one, but two wines from Nugan Estate. The first was ‘Alfredo’ Dried Grape Shiraz, similar to a Ripasso but made with Shiraz grapes. The second was a vintage near and dear to the hearts of the Nugan family. We were fortunate to sample the inaugural vintage of Matriarch McLaren Vale Shiraz 2006, named in honour of Michelle Nugan. Michelle was left to take over the family estate in 1986 after the passing of her husband Ken. In short, her efforts are a huge reason Nugan Estates are so successful today. After our lamb we were invited to view the kitchen area, group by group. I was astonished to see how clean the kitchen was; there was not a speck of food to be found out of place. I’m positive my kitchen would not be in the same shape if I were to serve a five course dinner for 120 people out of it! Our server, Josh explained how the sous vide machine worked and we had a small palate cleanser made of raspberry reduction and vanilla cream patisserie. 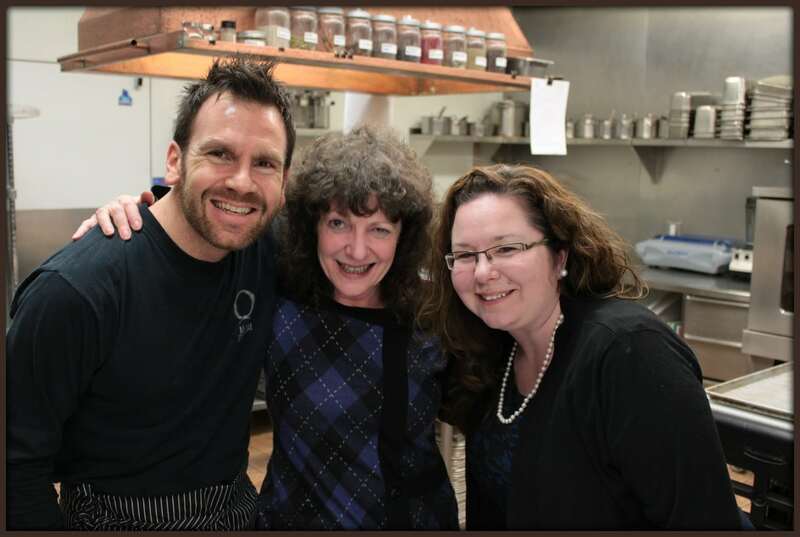 This mouthful was made on the ‘Anti-griddle’ which has a freezing surface of around -35 C. Chef Michele graciously sat for a photo op with Linda Garson and myself. When we arrived back at our tables, the dessert was being served. I wish I had eaten it right away instead of taking pictures because there was a lot of melting going on. I still enjoyed the flavours though and we all joked about licking our plates clean. 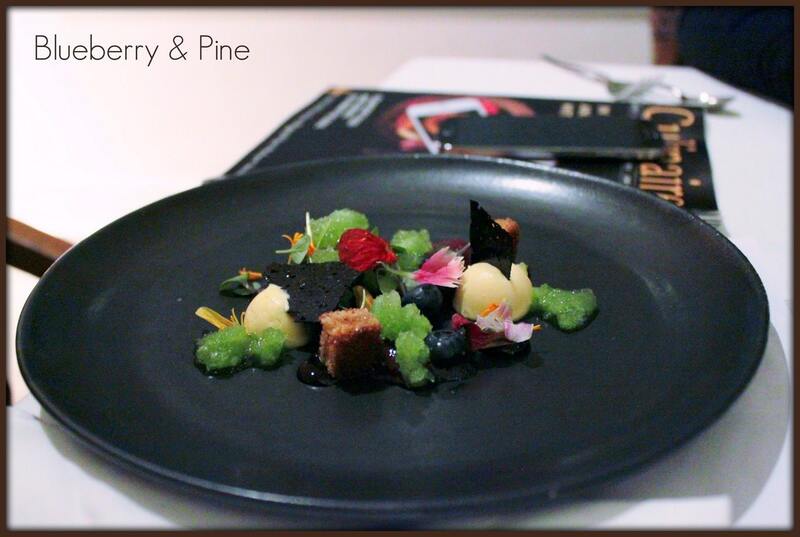 The dessert, entitled ‘Blueberry & Pine’ was just that. A beautifully scented light pine gelato with blueberry sorbetto and a crispy chocolate tuille. 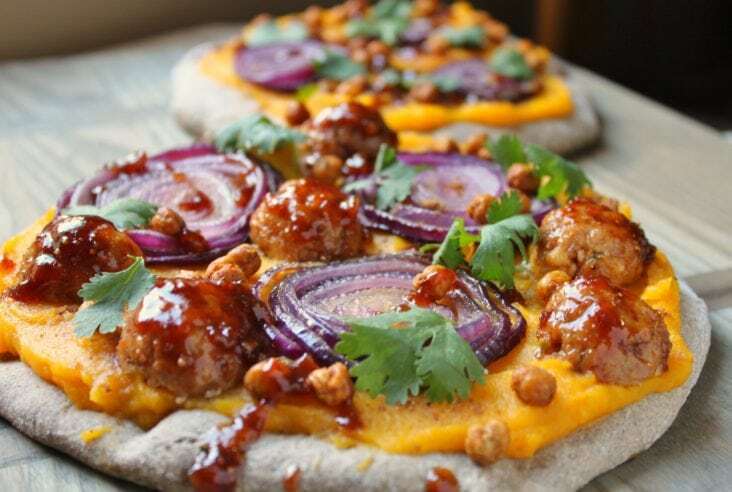 The flavours, as they are together in nature, also marry nicely on the palate. The simple inclusion of crispy, buttery brioche croutons was also interesting as they added texture and a bit of a fat component to the dessert. I thought that dish was a lovely way to end the evening but Chef Michele had other ideas…he served us a Mignardise which is akin to the Amuse Bouche at the beginning of a meal but which is meant to pleasantly end the meal. A parting gift of a dark chocolate with strawberry ganache, the cutest Peanut Butter and Jelly Lolly (yes, I clapped my hands in glee! 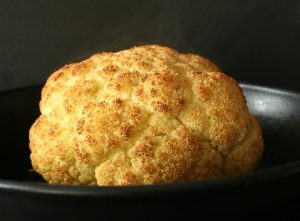 ), and a ‘Lemon Bomb’ accompanied by melon cubes. 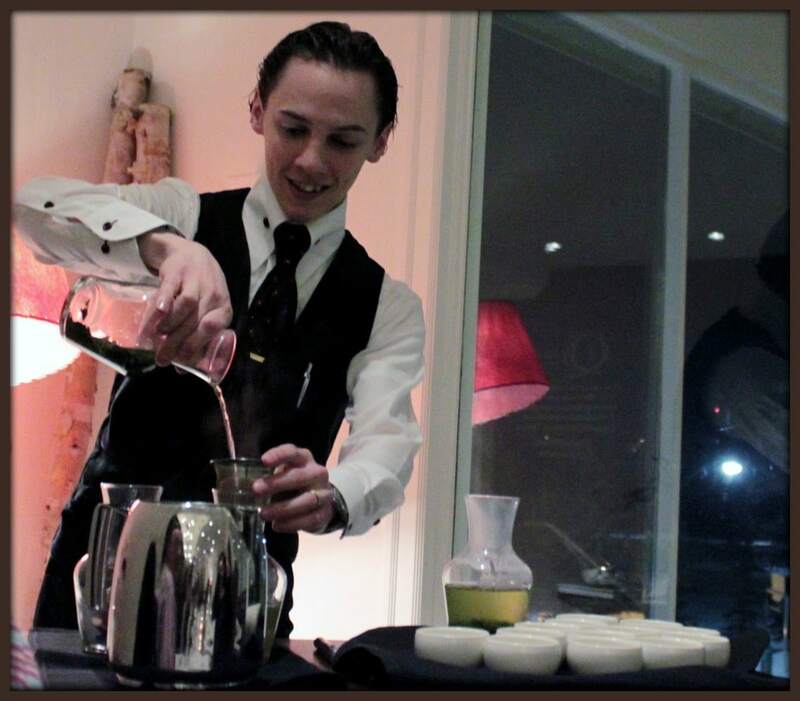 We soothed our excited stomachs with green tea, expertly made and poured by Q Haute’s very own accredited Tea Sommelier, Josh. Wow, looks incredible! Sounds like a rather big Chard–lots of oak? I need to attend more dinners like this! yes, stone fruit..a bit acidic and aged in French oak. You sure do! They are worth every penny 🙂 You live in CA? why the heck not!! Ah, but I live in PA (Pennsylvania)–big difference! oh…what? why did I think CA? my bad. Love it! You seem to score a few of these kickass dinners… You got the hook-ups eh? I never get invited to media events around town and there are quite a few I would like to go to and write about. I sometimes wonder if there is a master list of cool people somewhere…Holy crap I’m in high school all over again! Question: Do you make a drawing of how you want to plate your food or do you just wing it? Most of the time I wing it but I have used drawings once or twice. Mostly for apprentices… Get out the butchers paper and crayons, ya know.